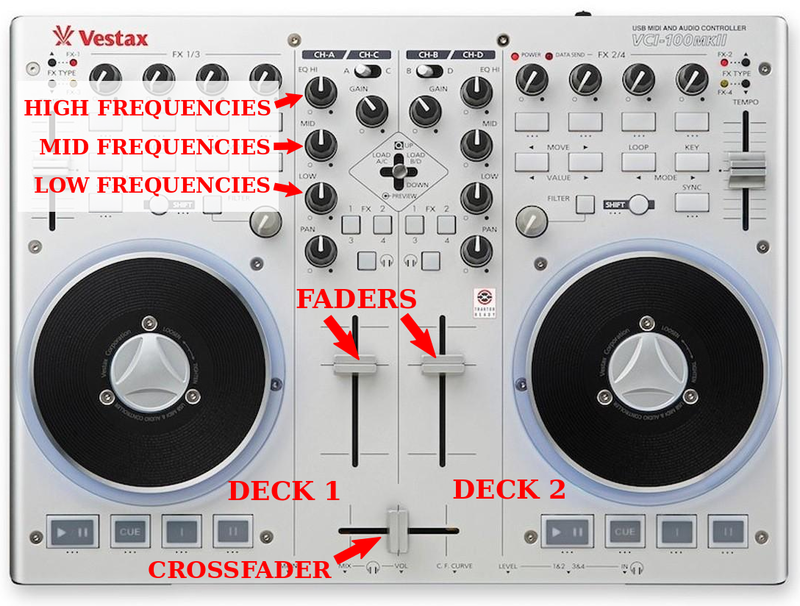 In order to "blend" two songs in the most natural and seamless way possible, DJs use their mixers to adjust the different volumes with precision. Knowing how to control and adjust the volume of low, mid and high frequencies of each deck is crucial to achieve smooth and successful transitions. Here are two basic and simple techniques to mix songs easily. 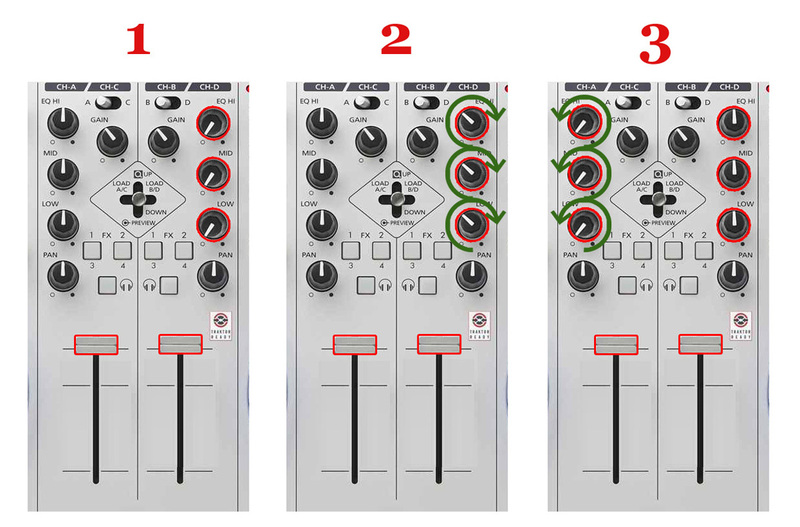 For this first mixing technique you have to use only the faders (the linear potentiometers on your mixer) to adjust volumes. While the song being played back is on deck 1 (the fader is all the way up, and thus the audience can listen to it), adjust the lows, mids and highs of deck 2 (fader to "0," so the audience can't listen to it) to get a well-balanced sound (for example, the three knobs halfway up). When the time comes, progressively bring up the fader of deck 2: both songs will start to blend. Keep on raising the fader of deck 2, and just when the overall volume starts to be a bit too loud, start bringing down the fader of deck 1 to compensate. Keep on reducing the level on deck 1 until the only song the audience can hear is the one on deck 2. 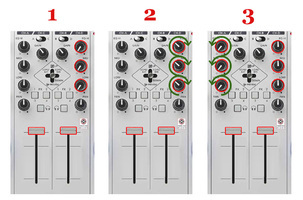 This time we'll apply the same principles of the progressive mixing technique with faders we just saw, but we'll start with the fader of deck 2 to all the way up and the low, mid and high controls set to the minimum. You will start by increasing the volume of each frequency band progressively. Once you reach a certain overall threshold start reducing the frequency bands of deck 1. When all three pots of deck 1 are to the minimum, bringing down the fader corresponds to "0". Progressive transition techniques, regardless of whether it's with faders or pots, work better if you apply harmonic mixing rules, considering that both songs will overlap the whole time while the transition takes place. If the keys of the songs being mixed are not "compatible" with each other you risk having a harmonic conflict. These basic techniques work fine as long as the tempos of both songs are in sync. The gain of each deck must be adjusted correctly before starting the transition, which you can check with your headphones and the pre-listening function. 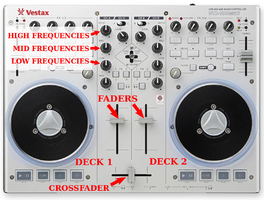 Finally, make sure that the crossfader will not hamper your transition by being all the way to either side of the decks, for instance! 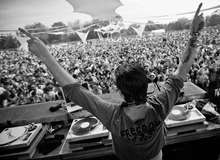 Article written by YannOO (Yann Costaz), DJ, producer and electronic music lover since 2003.